I just got a question about how to make a presentation fast. I know that in today’s busy world a speed of making slides is a critical issue. Here’s are few suggestions what you can do to speed up preparing your presentation in rush. If you’ve got only an hour or two to create a presentation, you have no time for creating a fancy design, for searching for inspirations or images on the web. You should focus only on the presentation itself, using whatever you have by hand already. Think for a moment, if you can reuse some older slides. Although this can be a trap if you spend more time searching for those presentations or adjusting them. So use this trick only if you have slides very close to your topic. Otherwise, it’s faster to start from scratch. Using keyboard shortcuts speeds up your frequently done activities. It’s much faster than working with a mouse. Ctrl+G to group selected objects, for example, if you want to zoom them equally or move them together. Ctrl+Shift+U ungroups the objects. Ctrl+Z to undo last action and Ctrl+Y to redo it. Ctrl+D to duplicate any object (works on a text box, a chart, table or shape). It’s like using Copy & Paste (Ctrl+C, Ctrl+V) but saving you one key hit, plus it does not use replaces the content of your clipboard, which has its advantages. Shift+[ or ] for making text smaller or bigger on all selected elements. What’s great, it works on tables and charts, too! This is a presentation file with general slides you can reuse. You can have there a graphical slide with 2 by 2 items that you need just to fill in the text. Or have there a set of icons you frequently use (a bulb for an idea, a question mark for a challenge, OK and not OK signs to show approval or rejection …). An example of commonly used business concept icons that can be in your timesaver slide deck. You can create your own slide deck looking at your older presentations. Or you can get slide deck from us (sorry for being a bit selly 🙂 but I truly believe this is of great help to any presenter). Creative Timesaver with hand drawn diagrams you want to be more unique. 4. 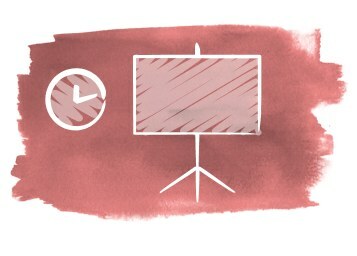 How you can save time on your presentations? Should you? Last but not least important advice is to reconsider: Realize the importance of your message. If it’s really that important, should you cut down on the quality of your presentation? Because when working under stress, we tend to do more mistakes. It’s hard to be creative and efficient. So the presentation outcome can suffer. If your boss or your client gave you the deadline, can you persuade him to go for quality instead of speed? What is your trick to make presentation preparation faster? How do you deal with stress when preparing PowerPoint slides? Do you use slide decks? Can you share your best keyboard shortcut? Get on our newsletter and never miss an announcement. You’ll stay informed about all of our new updates. Plus, if you sign in for our newsletter you’ll get a Creative slide design guide with free hand drawn shapes, absolutely FREE! and F12 for save as.